On Sep 26th, standing Deputy PM Nguyen Sinh Hung ordered the Management Board of the Ca Mau gas-power-fertilizer project to speed up construction of a port to receive materials necessary to ensure the construction progress of two new Ca Mau power plants. Also today, Viet Nam Machinery Installation Company (Lilama) installed the first 315-ton gas turbine at Ca Mau mixed gas turbine power plant 1. Lilama is now preparing to install the second gas turbine. The two 500MW turbines will be put into operation in March 2007, in time provide power for the 2007 dry season. With the progress of construction of the Ca Mau Power Plant 1, Lilama is speeding up construction of the Ca Mau Power Plant 2 to generate power by March 2008. The People’s Committee of Ca Mau Province has will soon hand over space from Ca Mau City to the gas-power-fertilizer complex for the construction of a route in this month. The Ministry of Natural Resources and Environment will approve a report assessing the environmental impact of draining hydraulic waste water at the MP3-Ca Mau sea pipe and Ca Mau Power Plant 1 by the first week of October. 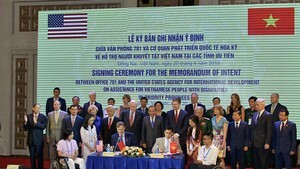 The Ministry of Industry will have Electricity of Viet Nam (EVN) provide the designs for electric systems to connect the Ca Mau Power Plant to the national electric system. As well, the ministry will approve a report on adjusting the construction of the Ca Mau fertilizer plant by October’s first week. The Viet Nam Oil and Gas Corporation (PetroVietnam) has to ensure quality and progress while protecting environment during the implementation of the project. The Ca Mau gas-power project invested by PetroVietnam includes a 1,500 MW-gas pipe system from the gas and oil area jointly exploited by Viet Nam and Malaysia. After being completed, the Ca Mau gas-power project will provide the national power grid with 10 billion kWh power per year, making up 18 percent of the country’s power production.